Can anyone advise on the best way to direct the new cable drops into the patch panel, considering that existing electrical wiring is in the way? I'm thinking a few curved pieces of coinduit/trunking will be needed or useful, the cable entry hole is under the patch panel box. 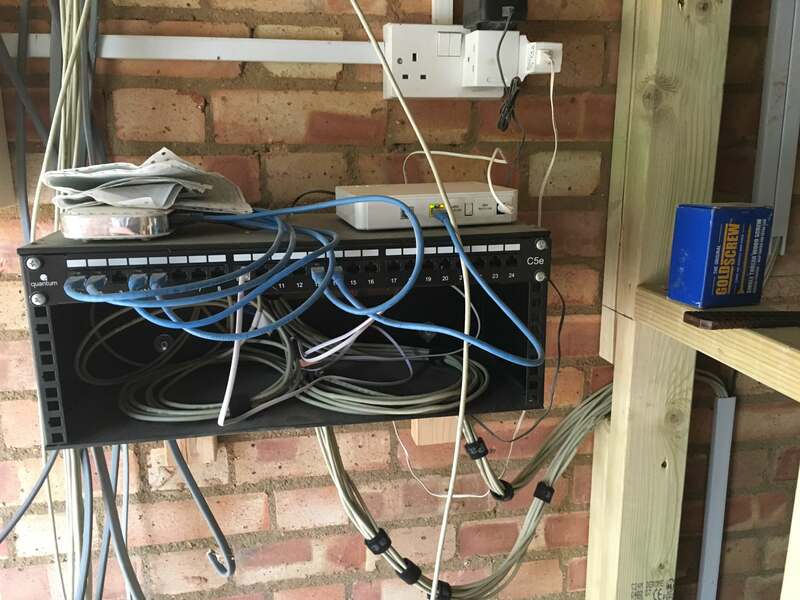 My electrician will be finishing it all off and I'm sure he'll be able to sort it out but he doesn't know much about running cat5 cable so any advice would be much appreciated. Get the vertical power and Cat5e separated as much as possible. 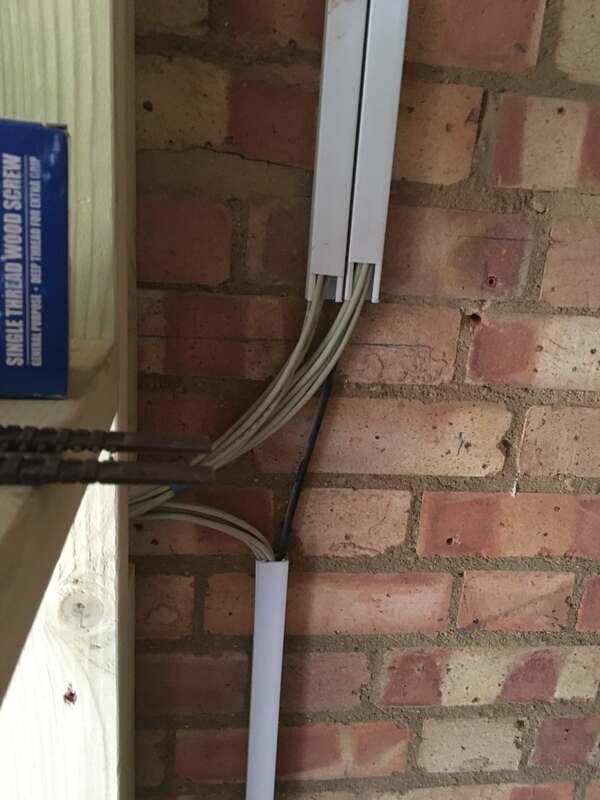 If you have to, where the Cat5e cross the power cables in the trunking, keep it at right angles and just bridge it with the trunking. If he's clueless enough to present the cables that close to mains cables and switchgear at the termination point, what chance is there of proper separation in the cable runs? my guess is slim to square root of poke all.... data cables should have a minimum of 300mm separation in parallel and should only cross mains, ELV cables and conductive pipework at 90 degrees, preferably also at 300mm separation but can be closer if needs be. 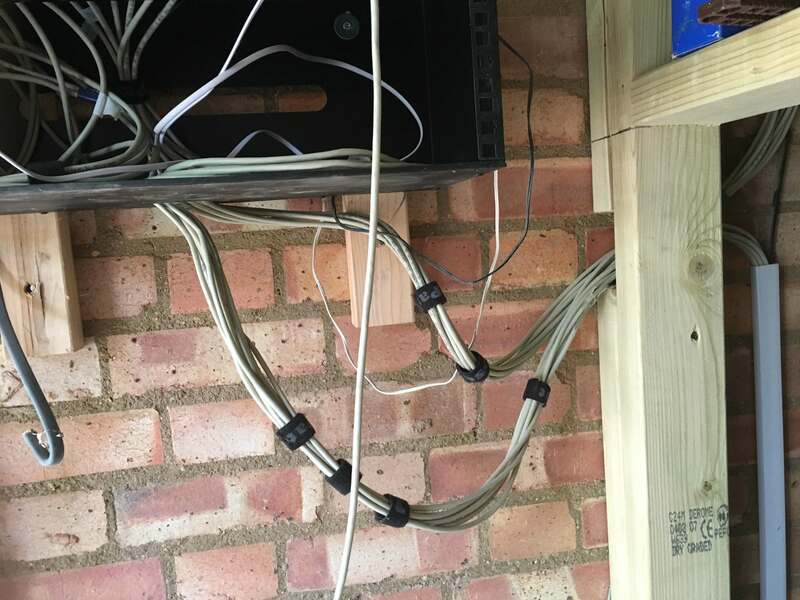 I did advise him that any parallel runs of cat5e and mains must be at least 100mm apart, which I can see that he's done, but the cables were dropped by his helpers, who are probably clueless. Thanks, that's what I was thinking, it'd be neater and keeps max separation between the power cables and data cables. So long as there's sufficient trunking to protect the cat5e and relieve any strain on the cables, then I'll be happy. So how about this? Is it too close to the double mains socket? 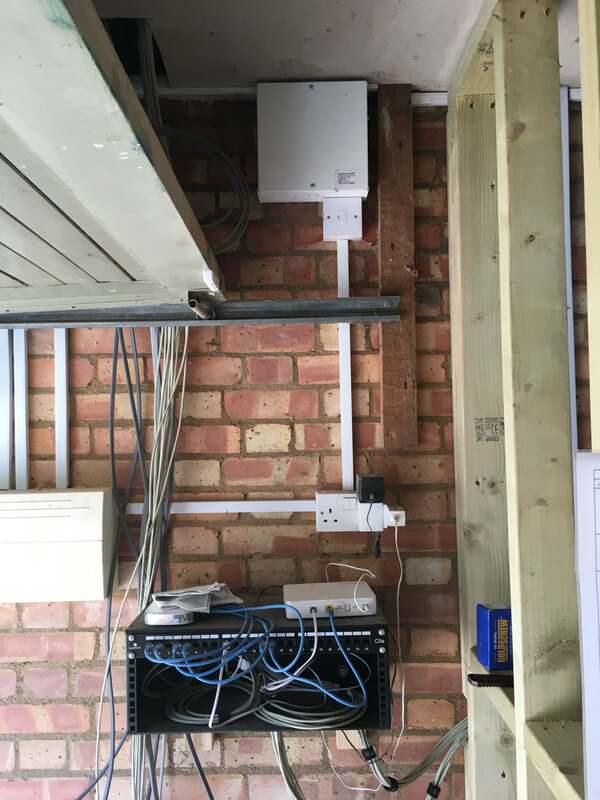 They've forgotten to add the BT point so maybe when that's added to the left of the cat5e socket the cat5e could be moved further away and wired into the backbox for the BT socket? Not ideal and I wonder how teh cables run behind that. 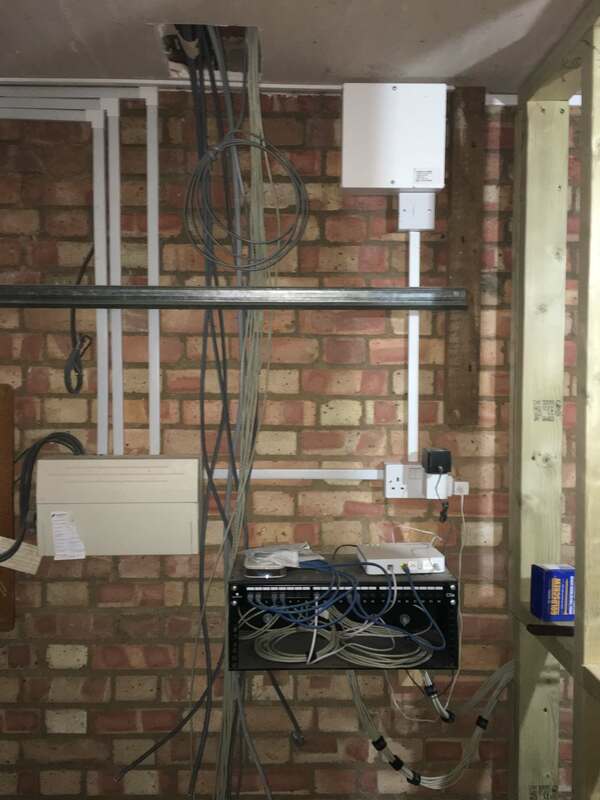 If you are going to feed a raw VDSL signal through one of the lines that will be the most susceptible to noise/interference even though they will be twisted pairs.. I would have put them maybe 150 to 200mm apart and ensure the cable are apart. They are misaligned, the two gang is not level!, cable behind are not protected, although at least there are grommets fitted. Way too close, having 10mm gap will look awful. A decent Armeg box sinker makes nice rectangular holes in blockwork in a few seconds, way quicker that the method used here. The builder would save enough time once he has done ten or so, to pay for the tool. I think the problem is that the electrician's junior guys have done the work and he hasn't told them what I told him from the outset. I've fed back to the builder that they'll need to be re-done. Wish I'd been on-site when they started doing that.